The Trawinski Hotel is situated in the heart of Poznan, far from the city's hustle and bustle, in the middle of the marvellous Citadel Park, that is the one of the most beautiful places in Poznan. 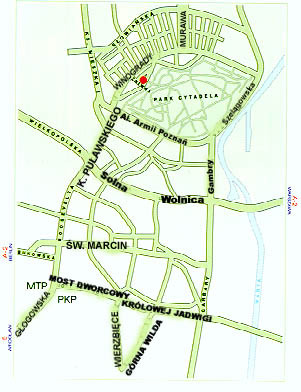 The Poznan Fair Grounds are nearby. Good location in a quiet area and high standard of services will assure guests unforgettable stay. The Trawinski hotel features 58 comfortable single, double, studio rooms and suites. There are also rooms for the non-smokers. All rooms are equipped with air conditioning, mini bar, telephone, Internet access, satellite TV. Guests can leave their cars on guarded car park. The Trawinski hotel cordially invites guests to dine in elegant restaurant where delicious dishes are prepared with particular attention to their quality. Guests can also spend their leisure time in the hotel’s cafe serving Viennese style desserts, lobby bar or night club. A spacious, comfortable and well equipped conference room as well as two smaller conference rooms are available for training and conference purposes. For recreation of guests the hotel provides a fitness centre, sauna, and Jacuzzi. Guests will also find such amenities like a hair salon and secretary service. We guarantee excellent service by our professionally trained staff. Welcome! The price of lunch is PLN 80 or USD 19. The Trawinski hotel is located in the city centre, about 4 km away from the main railway and bus station. It's close to its shopping centre and Poznan International Fair. The airport is 8 km away from the hotel. From the main railway station: no. 0, no.2, no. 7 buses reach the hotel ; You may also wish to use a taxi.